I've been drawing and painting for as long as I can remember! After being turned down by the Edinburgh College of Art, I went to Edinburgh's Telford College from 1987-1991, and came out with an HND in Scientific and Technical Graphics. Since 1992, I've been working steadily as an illustrator and designer. I have illustrated a series of health materials for people with learning disabilities that have won awards from the National Information Forum and the British Medical Association. My first loves were always horror, sci-fi and fantasy and those are the areas I specialise in when working freelance. After working in various media over the years, I've discovered that I really prefer to paint digitally in Photoshop, using a Wacom tablet. Unless otherwise stated, that's how all the work on this site was produced. I was short-listed for the British Fantasy Society's "Best Artist" award in 2011. I didn't win though. 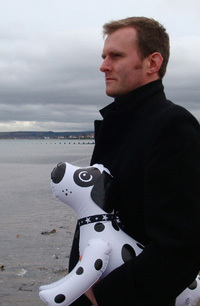 I live near the beach in Edinburgh with my partner Eleanor, and my inflatable dog.